When pulling aquatic weeds please be sure to remove the entire weed from the water and dispose of away from the shore. Fragments of the aquatic weeds can reproduce if left in the water. All new construction or modifications will require a permit from Reclamation District #800. If you have any question, feel free to contact us at 634-2351. 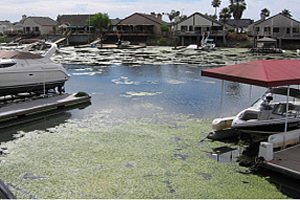 We've been aggressive in our efforts to eradicate these aquatic pests in Willow Lake. In the Spring of 2010, we successfully treated the Lake to remove plants and weeds, and we continue to monitor for new growth and spot treat as needed. Willow Lake is lowered the first week of January each year. This is a good time to perform maintenance on docks and slopes. Discovery Bay residents that are on deep water or Willow Lake are eligible to receive free rock for the slopes at the rear of their property. The rock is free, and it's the homeowners' job to place it or to have it placed. The District will drop the rock in the driveway. It is recommended that the homeowner place ply wood down on the drive way to prevent it from being damaged when the rock is dropped. The District holds no liability if the driveway is damaged during the drop. Also, the district will not come back if you decided you don't want the rock or if you think it's too much. Prior to rock delivery, an agreement form is required to be signed agreeing to the terms and conditions as stated above. If you are interested in receiving rock please complete the online form or print it out and send in and call the District at 925-634-2351.